Custom notification for individual chat. Also Read: 10 WhatsApp Tricks that you might not know. 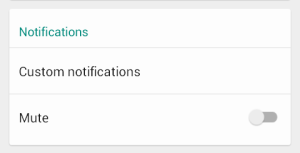 One of the best feature is we can set different notification for each contact or groups.Also we can mute the single contact for 1 year.So we can easily recognize the newly arrived message by listening to notification tone.Also we can set different notification tone and different call ringtone for each contact. 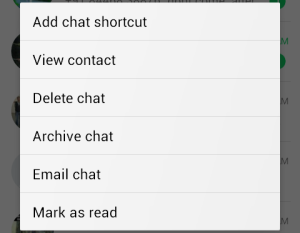 We can also mark chats as read or unread.Just tap on the chat and set tap on the last option. If you mark as a unread,the message count will appear next to the chat and it will be there until you click on it. 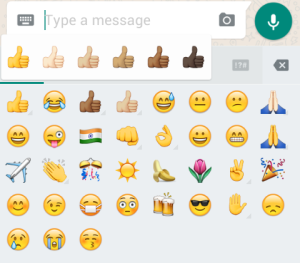 Whats app has added some new to emoji such as Gas station,national flag of Pakistan,Traffic signal,high five, Middle finger & a weird hand (I don’t know what its called). In the recent update some emoji’s are available in multiple colors. For example tap on the thumb-up emoticon you will see same emoticon in 6 different colors,tap on any of them. WhatsApp, could you please stop being so racist. So next time you call your friend, you needn’t worry about data. The new version of Whatsapp reduces your data consumption. In menu settings, under Chats and Calls menu, there is an option Low Data Usage. Click on it and save data while calling via Whatsapp. If you have not yet installed the latest version of WhatsApp, Download it from here. As WhatsApp doesn’t shows Changelog Notifications after every new update, most of the users aren’t aware of this features. Make sure to share this post with all other users. He is a student of Abasaheb Garware College Pune, India. He loves to play with Tech stuffs & learn about it. Top 12 most effective ways to save battery life on Android device.